Alternate Names: Ei! Čia mano žuvis!, Halfogócska, Hej! To je moje ryba!, Hej! To moja ryba!, Hej, to moja ryba! 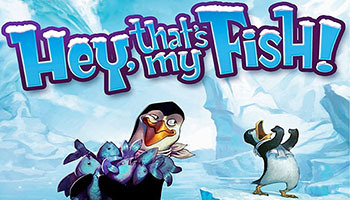 In Hey, That's My Fish!, players want to catch as many fish as possible with their waddle of penguins. Each turn, a player moves one penguin in a straight line over hex-shaped ice tiles with 1, 2 or 3 fish on them. The player then collects the hex from where the penguin started its movement from the table, thereby creating a gap which penguins can't cross on future turns. When a penguin can't move, it's removed from play with its owner claiming the tile on which it stands. 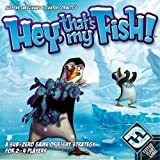 The player who collects the most fish wins. The ice is breaking up! Grab all the fish you can before they slip away. If you don't, another penguin will. It's every penguin family for itself. Your penguins must race across the rapidly dwindling ice floe to collect the juiciest fish and block off their rivals. But your penguins better stay alert! If a penguin gets stuck on an ice floe, he's done.